With 21 goals scored in seven Premier League games in England on Saturday, the total number of Premier League goals to date is now 19,955 – or 45 goals away from the 20,000th goal milestone. Manchester United scored four on Saturday to beat Wolves 4-1 while Norwich also scored four to beat Newcastle 4-2. The average for the 2011-12 season remains three goals per game, an astonishingly high figure compared to the 2.62 goals per game average over the 20 years of the Premier League. Sportingintelligence predicted last month that the 20,000th goal will be scored on 21 December, and the logic was outlined in the piece linked here. It remains highly likely that the 20,000th goal will be scored in the week before Christmas. 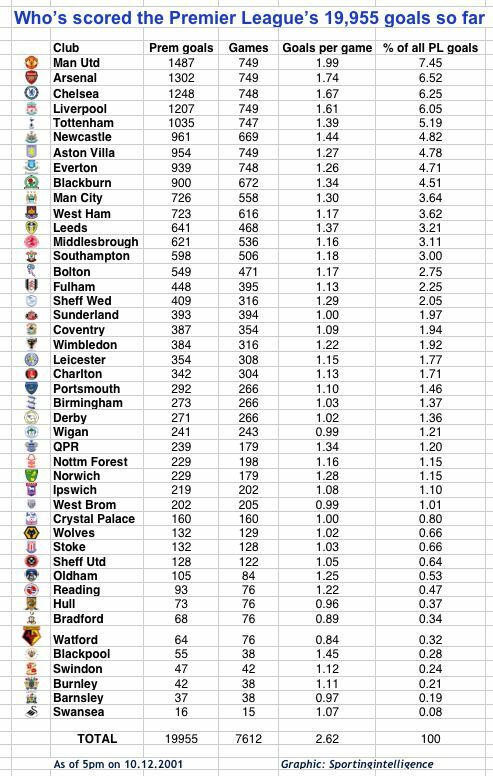 The updated table below shows the distribution of goals per club over the Premier League’s 20 seasons so far. United remain far ahead in first place with 1487 goals in 749 games at a rate of 1.99 per game, ahead of Arsenal, Chelsea, Liverpool and Tottenham in that order. Next article Blackburn funding crisis: what next for Rovers?